Allocating dollars to social advertising is a great idea - even amid rising competition, the cost per result for social advertising campaigns is by far the best, in comparison to other forms of digital advertising. The key, of course, is to have a strong strategy, which requires a little more thinking, a little more forward planning before jumping in. In this post, I'll outline the four must-have elements of a strong social advertising campaign. However, before we do that, we need to first establish a clear understanding of where social advertising fits into the buyer’s journey. While social media ads can generate conversions, they often don’t receive the credit they deserve due to last-touch attribution, which essentially gives credit to the last ad a user interacts with before they make a purchase. This isn’t ideal when you consider the fact that most social media activity is “top of funnel”, or awareness driven. That’s not to say you can’t structure campaigns to help convert people who are ready to buy at a higher rate, however that's for another blog. Historically in social media marketing, wisdom has told us to not put too much stock in the number of followers you have. This is partly true - attracting fluff followers to look good won’t help you much when it comes to actual business results. However, if you can grow a targeted audience, that has clear interest in your brand, you'll subsequently see lower overall advertising costs, greater reach and reinforced brand authority by using social advertising to grow your communities. Essentially, there's no shame in having a small, engaged community - so long as those individuals are helping move the needle on your brand’s key performance indicators. Brand engagement is the holy grail for social media marketing - after all, that’s why social media exists. Using social advertising to promote content to a specific audience can help to ensure you're delivering the right message to the right people, and not having to rely on Facebooks’ jerky algorithm (yeah, I said it). The important thing to remember when using social advertising to drive engagement is that not all engagement is created equal. It's very easy to get people to notice a catchy motivational graphic or a funny video, however it's much more difficult to get people to pay attention to the content that really speaks to what your brand provides. I'd offer that you might need a little of both - however you should focus your advertising dollars on the content that generates traction organically. These content pieces will pop the biggest when some dollars are put behind them. A social advertising campaign that drives highly targeted traffic to your website is the top driver of quantifiable business results, in my opinion. Yes, the other elements are important, however to get users to convert, you have to get them off Facebook and onto your site (unless you're running Lead Ads of course). Almost all social media platforms now have robust targeting parameters which enable you to hone in on your target customers. While social media traffic usually has higher bounce rates, lower time on site and less pages per visit than other digital advertising tactics, it's still very important to get fresh users to your site, and in your marketing funnels consistently. Typically speaking, a user will see your ad on social media, click it, browse your site, then get distracted by something else and leave - whether it be by closing their phone or leaving their desktop. This is where retargeting comes in. Using a website pixel, email list or even video views, you can serve ads to those users who've shown meaningful intentions with your site (or content) but haven't converted. This tactic is a great way to remind users about your brand at a cost-effective rate - we highly recommend leveraging retargeting in your social advertising strategy. The exciting thing about social media marketing is that there are always new tactics to try, new strategies to test. The scary thing is that there's only so much budget to go around, and days in each month. 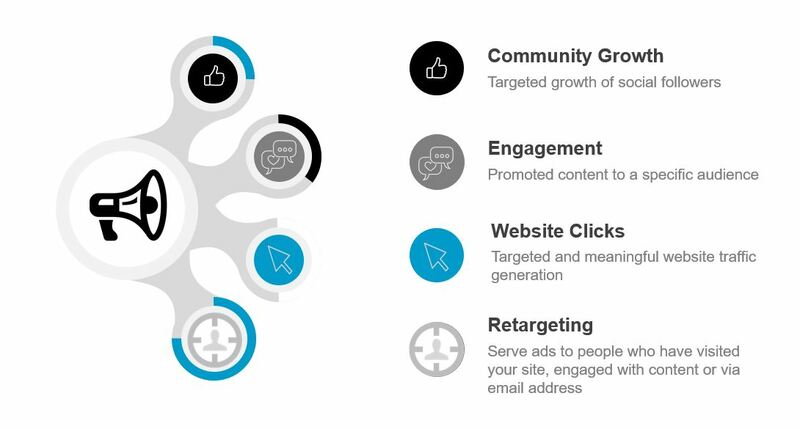 If you're trying to build a home base for your social advertising strategy, these four elements will put you on the path to success. Be sure to test relentlessly, abandon tactics that don’t yield results, and always optimize where possible.